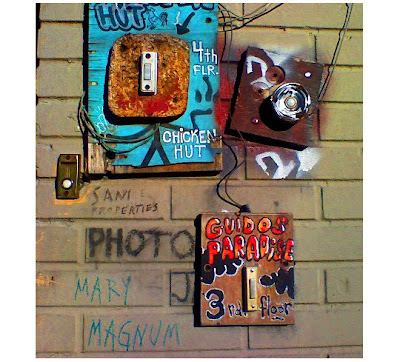 while running an errand for work this afternoon, i passed by these doorbells on the corner of the street. the low afternoon light was hitting them so perfectly. since i've been shooting graffiti pictures recently, i naturally reached for my camera, but of course the only camera in my bag was my cell phone. i kind of love it anyway. especially considering i've been shooting black and white and the color in this photo is so unbelievable.